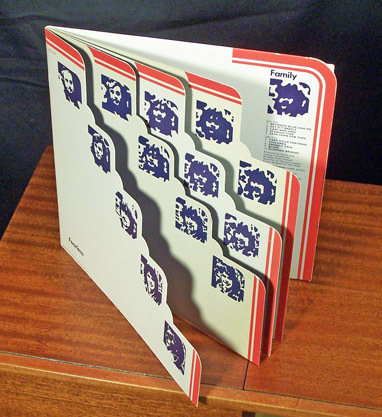 The 12X12 art space for LP album covers was a good format for creative die cut and multi-page creations. The 1971 album by the UK prog rock group “Family” presented (pre-digital) morphing faces of the band members on sequential step-cut pages. The music itself is unremarkable (except for a baritone-anchored a cappella ditty called “Larf and Sing”), but the cover is rather cool. we print on plain paper the family photos and create disc vcd/dvd. But how to cut the exact round shaped cover for the same. will u please let me know the device for the same.